After getting settled into the bed and breakfast, we drove into town to get some genuine Amish cooking. We both ended up getting veal Parmesan, which didn’t seem very Amish at all. My side dishes were applesauce and cottage cheese. The only thing that made this seem like anything but a regular diner is that the food was a bit worse, and the waitress actually seemed to be rushing us out of the place. I shouldn’t neglect to mention that the staff was either Amish or dressed Amishly enough that I wouldn’t know the difference. Fortunately, we stayed, or we wouldn’t have seen the ghost. Both of us try to stay abreast of current events, and we both read quite a bit. This really helps us keep our relationship vital, especially because our reading habits only intersect by about ten percent. I had been reading the book “The Theory of Almost Everything” by Robert Oerter, as another jaunt into the land of quantum physics. We talked about the book over our side dishes, which came about 37 seconds after we ordered our dinner (the first sign that we were being rushed in and out). I was just getting to the good part, about the ant on roller skates in a bowl (yes, Theory explains physics in a way that even I can understand – highly recommended reading) when one of our bowls, and a saucer, on the table, moved toward us about four inches. I asked Janelle if that just happened. She replied that if I meant did that bowl just move by itself, then yes, she thought that it did in fact just happen. Now, when a man is feeling all smart because he is currently discussing quantum physics with a beautiful woman who is interested in the conversation, he would (as I did) think that there must be some rational explanation for the moving dinnerware. The first thing that I did is check to see if the tablecloth was wet. It was not. Secondly, I tried to recreate the phenomenon myself. I placed the bowl and saucer back into their original position and watched them for about ten seconds. They did not move. I bumped the table. Nothing. I finally took the actions of an impatient scientist, and practiced some bad science. I tried to move the bowl with my hand. There was so much friction from the tablecloth that I couldn’t slide the bowl without the tablecloth itself moving as well. Not the easy glide, as I had expected. As absurd as an Amish Restaurant séance setup sounded, I looked under the table for invisible thread, magnets, or anything else that might have assisted in the illusion. But there was nothing. When I want to sound open-minded, I will tell people that although I’ve never seen a ghost, and although I think that most ghost stories are a cry for attention, (or overly sensitive people who have one unexplained noise in their house and decide that since they can’t explain it, their house must be haunted by “Great Uncle Joe, because he always tripped going down the stairs”) I also believe that there are too many stories out there for all of them to be fabricated cries for attention. I tell people that I believe there must be something to some of the stories. In reality, after a two year stint as a paranormal investigator, I really began to think that ALL of the stories are fabricated, and then passed along. People have such a strong desire to touch the unknown that they will say almost anything to relay the “experience” to their peers, and this desire also strikes such a chord in their own minds that they convince themselves that their stories are true. I have found to be the case, time and time again, and most strongly in paranormal investigators. I don’t know how I lasted two years with people who carried around books describing all the different “types” of ghosts. I do remember our group leader explaining the types to us before one our investigations. Most strongly, I remember that demons were considered a type of ghost. After explaining some of the qualities of a demon she said, “If you think that you are in the presence of a demon, don’t talk to it, don’t do anything. You come and get me!” Apparently she was the only one among our group who was qualified to deal with a demon. 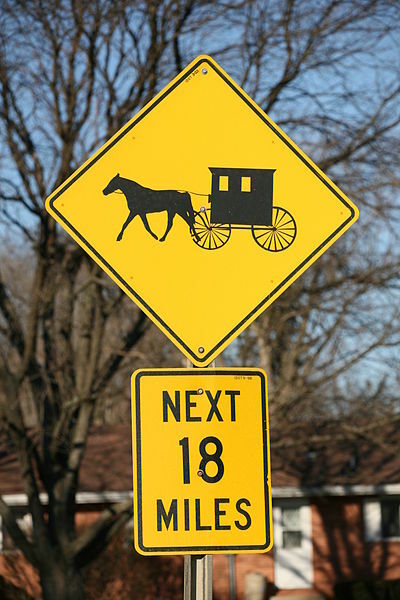 After two years of spending the night in condemned hospitals, ancient cemeteries, and world’s-most-haunted-libraries, watching people walking around with digital recorders, night vision and heat-sensing cameras, and all other manner of ghost-finding tools, it strikes me as ironic that the most paranormal experience of my life happened in broad daylight, in a crowded Amish restaurant, during a discussion of quantum physics, and within a few inches of a bowl of delicious applesauce. When we got back to the Bed and Breakfast, we watched the sunset from the front porch. I have never seen a sunset so fast. It seemed to take less than a minute, which seemed to add the the spooky atmosphere. I relayed to Janelle that this is how most horror movies start. Small town, middle of nowhere, a little diner a the beginning of the movie with an ambiguous odd moment. All of this lent to the fun but creepy ambiance of the journey. I know it’s not nearly as exciting as Demi Moore and Patrick Swayze in a phantasmic encounter in wet clay, but at least it was real.